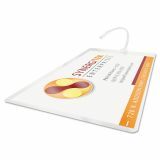 Laminated with LongLife™ pouches last 10 times longer than with a standard pouch. Prevents UV rays from fading documents. 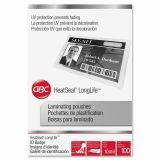 GBC LongLife Thermal Laminating Pouches, 10 mil, 2 1/2 x 4 1/4, 100/Box - LongLife&trade; thermal laminating pouch with ultraviolet protection keeps your document from yellowing or fading. Laminated documents and photos look their best longer and these pouches provide standard clarity, protection and rigidity. Multiple sizes, mil thickness and pack quantity available.